Park Home Assist are very aware that the real measure of an insurance policy isn’t just the competitiveness of the premium, or the comprehensive cover the policy provides, its also the quality of service when the unthinkable happens and a claim occurs. Park Home Assist believe that its insurer and claims partners provides one of the most effective claims service in the industry but rather than be complacent, Park Home Assist wanted to build on its service even further. On the 15th July Park Home Assist hosted a claims summit day for its Lloyd’s insurer (Canopius), it’s Claim Management Service (Davies Management Services), and a group of Loss Adjusters. 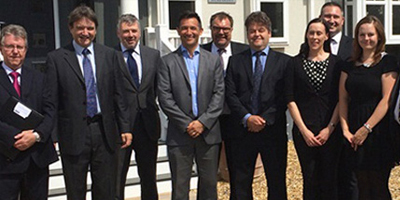 The day entailed an indpeth discussion as to how to further the already excellent claims service it provides, but also a tour of the Homeseeker Park & Leisure Homes ‘state of the art’ factory hosted by Homeseeker’s Managing Director, Silvano Geranio. Park Home Assist have an excellent and very close relationship with Silvano, who was one of the first manufacturer’s to join Park Home Assist’s Platinum Seal Structural Warranty Scheme, with Prestige Park and Leisure Homes, and this year Homeseeker also joined the scheme. Silvano, just like Park Home Assist, is never complacent and is always looking to set his company apart from the rest of the industry. With an order book full till February 2015, his hard work clearly is paying-off. With collaborations like this, both companies will continue to set the standards which other park home insurers and manufacturers will have to follow. A great day was had by all, and Park Home Assist would like to thank Homeseeker (Silvano Geranio), its insurer (Canopius) and Davies Management for a very beneficial day.